Denmark says it has arrested three people for praising those behind a September terror attack in the southwestern Iranian city of Ahvaz that killed at least 25, including a four-year-old boy. “Three people have been arrested suspected of violating the Danish law… on condoning terrorism,” a Danish police statement said on Wednesday. The trio is accused of praising the four gunmen who attacked a military parade in Ahvaz in Iran’s Khuzestan Province on September 22, sprayed the crowd with gunfire and killed 25 people while injuring some 70 others. The men were held on preliminary charges. However, police spokesman Bjoerke Kierkegaard said they had violated Danish laws and could face fines or up to two years in prison. Kierkegaard said all three were members of al-Ahwaziya — a terror group which claimed responsibility for the Ahvaz attack. The group, which receives backing from Saudi Arabia, has a record of carrying out sabotage acts in Khuzestan province. In addition to al-Ahwaziya, the Daesh terrorist group also claimed it was behind the attack and published online purported footage of the assailants. 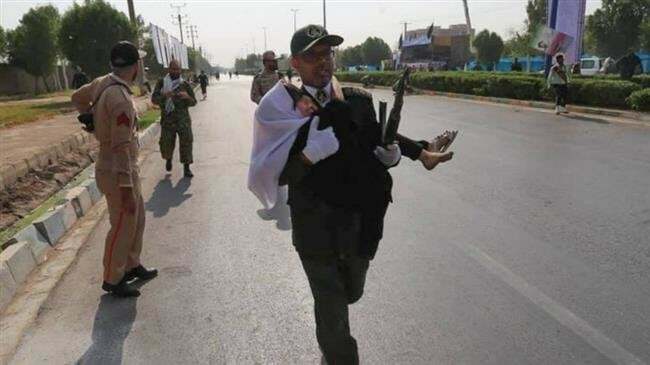 Three of the four assailants involved in the attack were killed by Iranian security forces, and a fourth one was arrested but later died of the wounds he had sustained during a security chase. Two days after the attack, the Iranian Intelligence Ministry said in a statement that its forces had found the hideout of the terrorists involved in the attack, and arrested 22 elements in connection with the incident. Some explosives, firearms, military vehicles and communications facilities were also seized from the hideout, the statement added. Iran also summoned the ambassadors of the Netherlands and Denmark as well as the chargé d’affaires of Britain over sheltering members of al-Ahwaziya.